A response to Olivia Brodock, the Homeschooler who survived. My original plan was to finish going through Gothard’s twisting of definitions today, but something has distracted me. 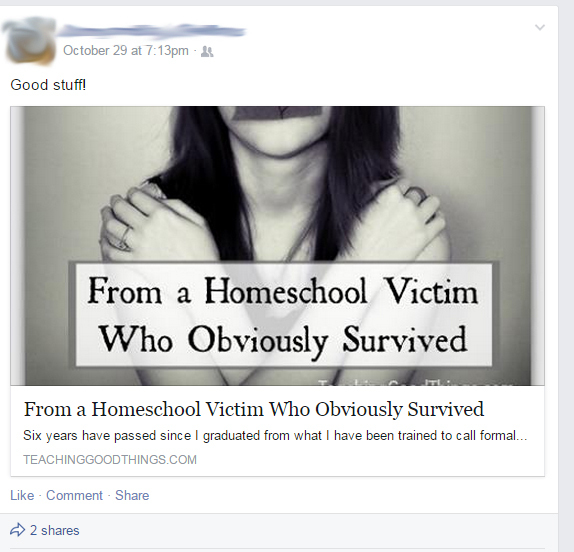 Several friends recently shared a blog post, From a Homeschool Victim Who Obviously Survived. The first thing that caught my eye was the image. That is the same image that has been used by Homeschoolers Anonymous (HA) in their reporting on the TOS abuse cover-up scandal. (It’s worth noting that the page now shows a different image, and there’s a note saying they had to take the original image down because they didn’t have permission to use it.) Using that image is extremely telling. For anyone who is aware of the current controversy sweeping the homeschooling community (namely, how to respond to a large number of alumni who are bringing grievances to the table) it places the blog post in the very center of that discussion. And let’s be honest, that is precisely what the author intended. This author intentionally found the image used by HA and used it to set the tone for her post. This choice tells us a lot; it tells us what context she intended her audience to frame her post in. So, having set the context in which we are to understand her post, the author goes on to satirize the stories of abuse victims. Let’s look at what she says. It took me most of the last six years to really understand what was done to me during those years of “home schooling“. Notice the passive voice; “what was done to me.” Again, the author is using the language of someone who has been victimized. Throughout the post, this author continues to use language that is used to describe abuse. This is purposeful, intentional use of language that fits abuse. This author, by satirizing the stories of abuse survivors in this way, is attempting to make light of their plight. Sometime in the past day or two, a note has been added to the top of the page. Disclaimer: This post is not meant to discredit real abuse. Real abuse happens within all walks of life. It does need to be addressed and dealt with – with punishment for the offender and healing for the very real victim. But this post is a satire about a life that often seems hard and unfair. What child does not think life is unfair at times? No, this is not “a satire” about when kids think life is hard or unfair. The author is sure to specify in the second paragraph that she is now 6 years past graduation. She claims to be writing with the perspective of an adult, reflecting on her childhood years. You can’t just slap a disclaimer on the front and pretend it’s suddenly satirizing something totally different. This is oddly reminiscent of my previous post; you can’t just up and decide to change the clear meaning of something just because you want to. You can’t use the language of abuse to make light of it, and then claim you didn’t mean to discredit real abuse. To my friends who are reading this post because I posted a link on your Facebook page: Please understand that I do not mean to point the finger at you and say you are somehow a part of this culture of making fun of abuse. I don’t expect you to follow all the latest developments in my niche of interest. I don’t expect you to recognize that image, or the wording that was used in the post and respond the same way I did. I do, however, expect a homeschool blogger to be aware of homeschooling issues, and to show love and sensitivity towards people who have experienced real abuse (which you can totally do while maintaining that your own experience was positive). I replied to your sharing of the blog post not because I’m angry with you, but because I feel it is important that people be aware of the context. I trust that you are a reasonable and kind person, and that you understand that abuse has occurred in some homeschooling families, and that it’s not something to make a joke about. Hi, I’m Olivia. I wrote From A Homeschooler Who Obviously Survived. Let me start by saying thank you for shedding light on abuse. Period. The Gothard scandal primarily. Horrible things happened, things I wouldn’t know about if it weren’t for voices like yours and Chad Harris (a fb friend of mine). So, thank you for fighting that battle and shining a spotlight into a dark corner of the homeschooling world. Secondly, the image. I had never read HomeschoolersAnonymous before my post went viral. So claiming that I stole the picture to stir up trouble, or put myself in the middle of the fray, is simply not true. I understand how you came to that conclusion, but it makes it no less false. I Google searched “homeschool victim”, clicked images and it popped up. As soon as I realized it was a HA picture it was replaced. Thirdly, when you say “that is precisely what the author intended”, I did intend for the image to set context. But the context was this; I’d read a post from a homeschooler who was claiming to be abused because she had to wear hand me downs… The problem I had with her, the reason I wrote the post, wasn’t to make light of real abuse but to shame the people who are claiming to be abused with things that are not abuse. Does that make sense? To me, it’s like having to wait in line at the doctors office when you are really sick or have a broken arm when there are people there, taking up valuable attention with little cuts and scrapes. I am not a homeschool blogger. I occasionally write. I don’t keep up with everything in the homeschool world because I work three jobs and have no time. But I am, or at least I do earnestly try, to be loving and sensitive. I have served meals at homeless women’s shelters, I am on the board of a crisis pregnancy center, I have adopted siblings who were abused before they came to us, I have friends who were physically and mentally abused. I know what abuse is and that is why I wrote the post, because I also know what it is not. The tone I was going for was more “stop whining about a paper cut, because there are others with broken bones” vs. “abuse is laughable, it doesn’t happen”. Thank you, again, for fighting the good fight. If I had intended it as you portray I intended it, then I would applaud your post. I get it. But I’m not half as clever as you give me credit for and not half as half witted as a post with those intentions would insinuate. Oliva, thank you so much for reaching out and responding to my post. I realize it can be quite scary to walk into the “enemy camp” and defend yourself, and I really do appreciate your courage in posting here. I understand what you are saying about the use of that image. Perhaps this is one time that the phrase “an unfortunate choice” could be legitimately used. Yes, I understand your motivation, but I’m afraid that doesn’t remove the impact your words had. Whether you were aware of the larger conversation happening in homeschooling circles or not, your words and tone aligned you solidly with those who wish to dismiss and ignore abuse victims. That is the reason your post went viral. It wasn’t because so many people happened to read the same post, and were offended that someone complain about wearing hand-me-down clothes. It went viral because there is a very large group of people who have devoted decades of their lives to a lifestyle that they were told would guarantee well behaved, well developed, Christian adults who made their parents proud. These people feel threatened by the voices of homeschool alumni speaking out against abuse because they are afraid all their work was wasted. They are afraid that the perfect results promised them by people like Bill Gothard and Micheal Pearl and Doug Philips might not be theirs. Sadly, this fear is causing many of them to adopt an us-vs-them mentality and lash out against wounded people. Rather than reaching out to victims with love and compassion, some are doing whatever they can to make them go away. Might I respectfully suggest that you did not communicate what you intended to? I am afraid that your post has become a rallying point for those who want victims to be quiet and go away. I would strongly suggest that you consider clarifying your intentions on the original post, and perhaps use your platform to encourage others in the homeschooling community to acknowledge and show sensitivity towards abuse victims. Might I also go as far as suggesting you offer an apology to those victims, even though you did not intend to make light of their plight? Your homeschooling experience was obviously positive. That’s wonderful! Mine was too. My wife and I are expecting a little girl next month, and we’re making plans to homeschool her. I feel it is important that people like you and I be a part of the conversation. Stories from both sides need to be heard. Both are legitimate, and both matter. Please don’t think that I don’t want your voice to be a part of the conversation. I just want those of us with positive stories to show Christ-like love towards those who were not so fortunate. I know I am getting expedrience everyday by reading thes nice articles or reviews.